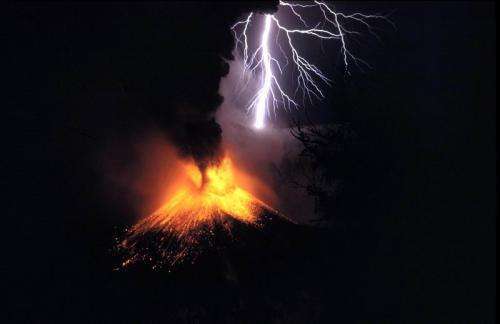 A small eruption of Mount Rinjani, with volcanic lightning. Location: Lombok, Indonesia. Credit: Oliver Spalt, Wikipedia. A new geological record of the Yellowstone supervolcano's last catastrophic eruption is rewriting the story of what happened 630,000 years ago and how it affected Earth's climate. This eruption formed the vast Yellowstone caldera observed today, the second largest on Earth. Two layers of volcanic ash bearing the unique chemical fingerprint of Yellowstone's most recent super-eruption have been found in seafloor sediments in the Santa Barbara Basin, off the coast of Southern California. These layers of ash, or tephra, are sandwiched among sediments that contain a remarkably detailed record of ocean and climate change. Together, both the ash and sediments reveal that the last eruption was not a single event, but two closely spaced eruptions that tapped the brakes on a natural global-warming trend that eventually led the planet out of a major ice age. "We discovered here that there are two ash-forming super-eruptions 170 years apart and each cooled the ocean by about 3 degrees Celsius," said U.C. Santa Barbara geologist Jim Kennett, who will be presenting a poster about the work on Wednesday, 25 Oct., at the annual meeting of the Geological Society of America in Seattle. Attaining the resolution to detect the separate eruptions and their climate effects is due to several special conditions found in the Santa Barbara Basin, Kennett said. One condition is the steady supply of sediment to the basin from land—about one millimeter per year. Then there is the highly productive ocean in the area, fed by upwelling nutrients from the deep ocean. This produced abundant tiny shells of foraminifera that sank to the seafloor where they were buried and preserved in the sediment. These shells contain temperature-dependent oxygen isotopes that reveal the sea surface temperatures in which they lived. But none of this would be much use, said Kennett, if it not for the fact that oxygen levels at the seafloor in the basin are so low as to preclude burrowing marine animals that mix the sediments and degrade details of the climate record. As a result, Kennett and his colleagues can resolve the climate with decadal resolution. By comparing the volcanic ash record with the foraminifera climate record, it's quite clear, he said, that both of these eruptions caused separate volcanic winters—which is when ash and volcanic sulfur dioxide emissions reduce that amount of sunlight reaching Earth's surface and cause temporary cooling. These cooling events occurred at an especially sensitive time when the global climate was warming out of an ice age and easily disrupted by such events. Kennett and colleagues discovered that the onset of the global cooling events was abrupt and coincided precisely with the timing of the supervolcanic eruptions, the first such observation of its kind. But each time, the cooling lasted longer than it should have, according to simple climate models, he said. "We see planetary cooling of sufficient magnitude and duration that there had to be other feedbacks involved." These feedbacks might include increased sunlight-reflecting sea ice and snow cover or a change in ocean circulation that would cool the planet for a longer time. "It was a fickle, but fortunate time," Kennett said of the timing of the eruptions. "If these eruptions had happened during another climate state we may not have detected the climatic consequences because the cooling episodes would not have lasted so long."